It’s important for consumers to do their homework before making a purchase — especially when buying a relatively expensive item, such as a stick vacuum. But there are so many options and price points, and reading individual reviews can be time consuming. Here at NerdWallet, we’ve done the research for you. If you’re considering the popular Dyson V6 Absolute, we’ve analyzed consumer reviews and rankings so you can decide if it’s right for you. 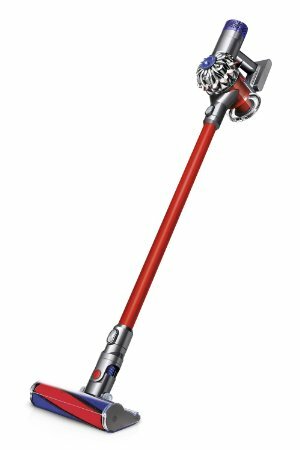 The Dyson V6 Absolute is a sleek red, silver and blue stick vacuum that comes with two separate heads. The first is a soft roller that suctions both fine dust and larger debris, designed for hardwood floors. When it’s time to clean carpets, switch to the second option, which is a direct-drive cleaner head that reaches between carpet bristles. If you need to clean hard-to-reach areas, such as stairs or your car’s interior, slip off the aluminum wand and convert the V6 Absolute into a powerful hand-held vacuum. And if you need to clean walls or ceilings, its balanced, lightweight design makes the process as easy as cleaning the floor. This model also comes with a docking station that charges and holds attachments, a mini motorized tool with stiff bristles for tough jobs, a crevice tool and a soft dusting brush for cleaning delicate areas. It also features push-button bin emptying and an option that gives you six minutes of enhanced high-power suction. Three-and-a-half hours of charging gets you 20 minutes of cordless cleaning power. The Dyson V6 Absolute is available through the Dyson website for $599.99. You can find it for less at Amazon. Stick vacuums tend to be lightweight and are often cordless, so it’s no wonder they’re such a popular option. In order to determine how well various makes and models worked, we analyzed reviews of some of the most popular stick vacuums on the market to come up with a definitive buyer’s guide. We looked at expert opinions from review sites such as The Sweethome, CNET and Good Housekeeping. Next, we analyzed user reviews to see what shoppers were saying about the various attributes of each vacuum. To make our ratings, which run from a low score of 1 to a high of 10, we considered what users reported about the vacuums’ overall performance and how they performed in a variety of settings, such as on stairs or hardwood floors. We also factored in reviewers’ observations on characteristics such as noise level, durability and battery life for a well-rounded look at each model. The V6 Absolute ranked second among all the stick vacuums we evaluated. It had an overall rating of 9.0, but a 9.8 on its cleaning performance. Its ease of use clocked in at a solid 9.2. In addition to the three major categories, we also considered how well each model cleaned specific floor types, battery life and durability. The Dyson V6 Absolute had perfect scores on cleaning hardwood floors, stairs, and pet hair. It also scored a 10 for durability. However, it scored just a 4.1 on battery life. Users found the Dyson V6 Absolute worked well for pet hair pickup. They also cited its weight and powerful suction as positives, and said it was especially good on hardwood and tile flooring. Some users complained that shag carpeting got caught in the V6 Absolute’s bristles, which caused it to power down in order to save energy. Some also found it a little more difficult to push on carpeting than on tile or hardwood floors. Users consistently noted the V6 Absolute’s powerful suction, especially when in the enhanced max power mode. It was also praised for being light and easy to use. Because it lasts only 20 minutes on a charge, it’s better for people with smaller homes or for use as a supplementary vacuum. The Dyson V6 Absolute came in second to another Dyson product — the V6 Motorhead — which scored a 9.3 overall and sells for $200 less than the V6. The Motorhead also scored slightly higher than the Absolute on durability, as well as carpet cleaning — 10, compared with the Absolute’s 9.4. If your house has more rugs than tile or wood floors, the Motorhead may be the better — and less expensive — option.